• Pitcher Nearly Brain Dead After Accident: Miracle happens as Seton Hill’s Kenny Wells recovers after being hit in back of skull by catcher’s throw to second. 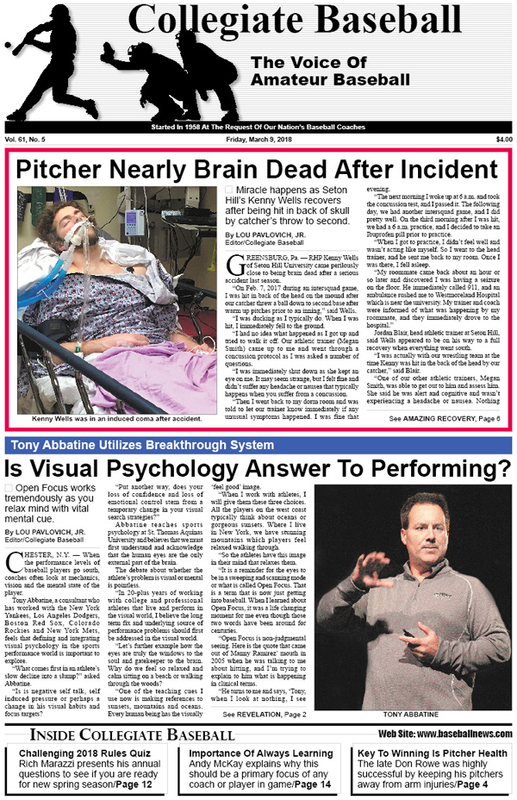 • Is Visual Psychology Answer To Performing? : Tony Abbatine utilizes breakthrough system that works tremendously. • Editorial: Road warriors should be extremely careful on highways of America. • Lou Pavlovich Column: Injuries to pitchers can cripple any ball club, and Brewers’ Don Rowe did a remarkable job of keeping hurlers healthy. • Collegiate Baseball’s National Players Of The Week: RHP Joe DeMers of Washington fires the first perfect game in school history…three no-hitters are thrown…duo of players belt 5 home runs each with multiple RBIs, plus more. • NCAA Div. I Notes: Santa Clara’s Jake Brodt hits two grand slams in one inning to become seventh player in NCAA Division I history to do it…Central Michigan’s Zach Heeke is hit 4 times in a game…pitcher for Bradley is a licensed, commercial pilot, plus much more. • Collegiate Baseball NCAA Div. I Top 30 Poll Presented By Big League Chew: Oregon St. rolls to 8-0 record as Beavers are ranked No. 1, plus full notes. • NCAA Div. 2 Notes: Rollins erupts for 7 runs in bottom of ninth to stun Bentley, 9-8…RHP Caleb Bly of Oklahoma Baptist strikes out 29 batters in 13 innings…Lynn’s Patrick Corrian hits for the cycle, plus much more. • Ruleball With Rich Marazzi: 2018 Rules Quiz will test your baseball knowledge. • Junior College Notes: Walters State’s Brett Jones tosses perfect game in first outing in 2 years…Nick Delp of Harford C.C. (MD) survives cancer…Cody Payne of Catawba Valley steals 11 bases in seven games, plus much more. • High School Notes: 2018 tournaments across USA feature elite ball clubs. Here is a rundown on teams that are scheduled to appear. • Special Report From Andy McKay: Learning is a prerequisite to growth, improvement and self confidence. • NAIA Notes: Peru State’s Wayne Albury celebrates 700th career victory…St. Thomas adopts Golden Rake Award to honor players who have productive offensive days in a winning effort, plus much more. • NCAA Div. 3 Notes: Ozarks’ Justin Crider produces two walk-off hits against Berea College…Christopher Newport’s Jordan Mason goes 5-for-5 with 3 singles, a double and triple over Virginia Wesleyan, plus much more. To purchase the March 9, 2018 edition of Collegiate Baseball or subscribe, CLICK HERE.